Submitted Photo From left, Theresa Workman, Francie Mullins, Jodi Jenkins, Becky Wood, John Wood, Herman Potter and Dawn Claytor. 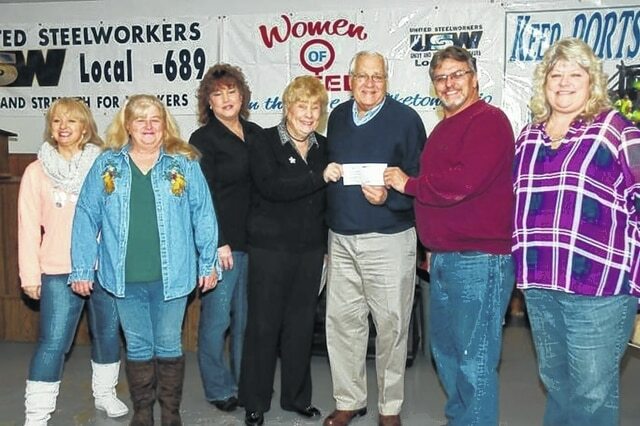 The United Steelworkers’ (USW) Local 1-689 Women of Steel recently donated $500 to the Cornerstone United Methodist Church Food Pantry in Portsmouth, Ohio. Approximately 200 families a month are given from the pantry’s shelves. During the previous month, members of the Woman of Steel collected donations from employees of the former Portsmouth Gaseous Diffusion Plant during a “bucket drive” held at the site. More than 2,200 workers are employed at the Department of Energy’s (DOE) site in Piketon, and approximately 850 employees are members of the USW. The USW Women of Steel is an arm of the United Steelworkers union, the largest industrial union in the United States. For more information, visit www.usw.org.